7-10 working days from approved artwork (weekends and public holiday not included). Additional options added to product may extend this time, Allow an extra 1-2 working days for an option. 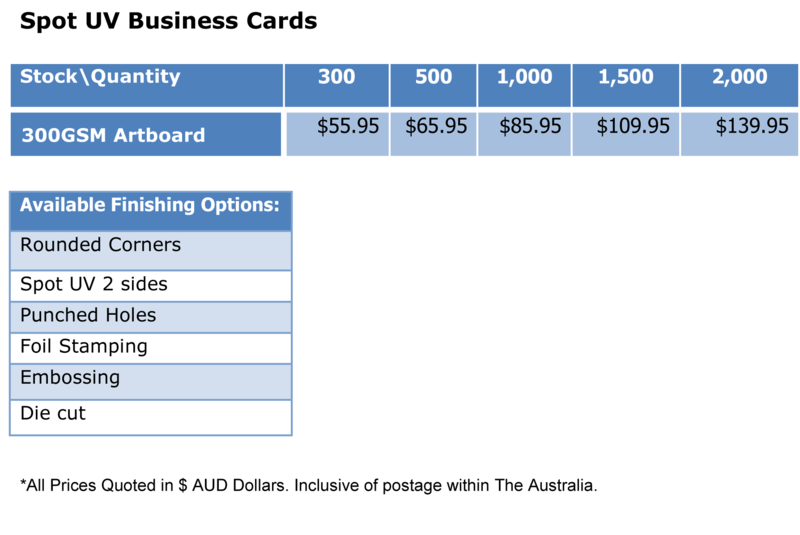 We use Australia Post –Registered Post or Express post for our deliveries within Australia. 3.62" x 2.20" 2.20" x 3.62"
--It provides a highly striking means of introducing who you are. --It not only creates a deep and maximum contrast, but gives life to your print. -- It is very effective for greeting cards and low GSM papers. Spot UV (Ultra Violet) refers to the placement of a glossy coating on specific areas of the card. Whereas glossy business cards are shiny all over, spot UV business cards are typically printed on non-shiny cardstock like silk. The spot UV gloss is then coated over the silk business card stock on specific parts of the card. The effect makes the glossy or spot UV areas jump off the card, especially when reflecting light. The effect does't change the underlying color, it simply makes it shine. Where to Add Spot UV to Your Card? The best place to add spot UV to your business cards is the logo. 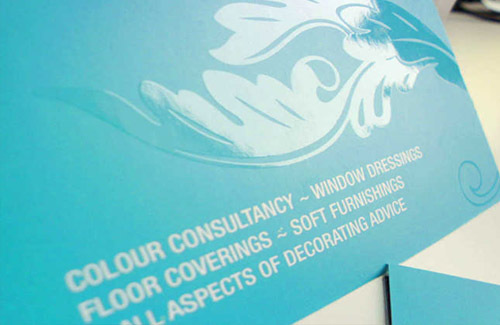 Most logos are designed to be eye-catching, so embellishing them with spot UV is a natural fit. You could also apply spot UV to the company or contact details, which produces a pseudo raised-letter effect and is extremely cool looking. Can Spot UV (Ultra Violet) Varnish Business Cards be written on? Yes they can be written on, but its recommended that a permanet marker or ball point pen is used as other pens tend to smudge easily. Also only area without the Spot UV can be written on. Can I split my 1000 business cards order into 2 names or 4 names? Unfortunately not, you would need to order the individual cards per person, so 500 x 2 kinds or 250 x 4 kinds. What are your file specifications? For the best results, we recommend PDFs but we can accept AI, PSD，CDR, JPEG, EPS, or TIFF files as well. Please keep all safe text at least 2mm from the trim line. Files must be CMYK, not RGB. PDFs, EPS and AI files: Please convert all fonts and text to outlines and flatten all transparencies. JPEG, PSD, TIFF: Please flatten all files. You may save your files at 400 DPI (300 DPI is the minimum). Can you cut my cards a different size? Our standard business card size is 90mm x 54mm. We are able to cut your cards to a different size as long as they are smaller or larger than our standard. Can you create a design for my business? Yes, you have two ways to create the design. Option 1: We design for you. Email us the needed information you want to put on the cards, we would create professional designs for your selection. Option 2: Select a design template to get a free design. If you order print products from us, design service is free of charge. Simply pick out the templates you like(click here),write down the text information below and upload images. We’d like to finish the design for you based on the templates. We offer a fast, reliable, door-to-door, customs-cleared express delivery service for business cards and plastic cards to over 210 countries worldwide. Shipping and processing costs vary by the weight of your order you select during checkout.